Trent Ostby (‘20) clears a height. The Luther College Women’s and Men’s Track and Field teams competed at both the St. Mary’s Open and the Drake Relays last weekend. Luther brought nine women and 10 men to Des Moines for the Drake Relays, while the rest of the team travelled to Winona, Minnesota to compete at St. Mary’s University. 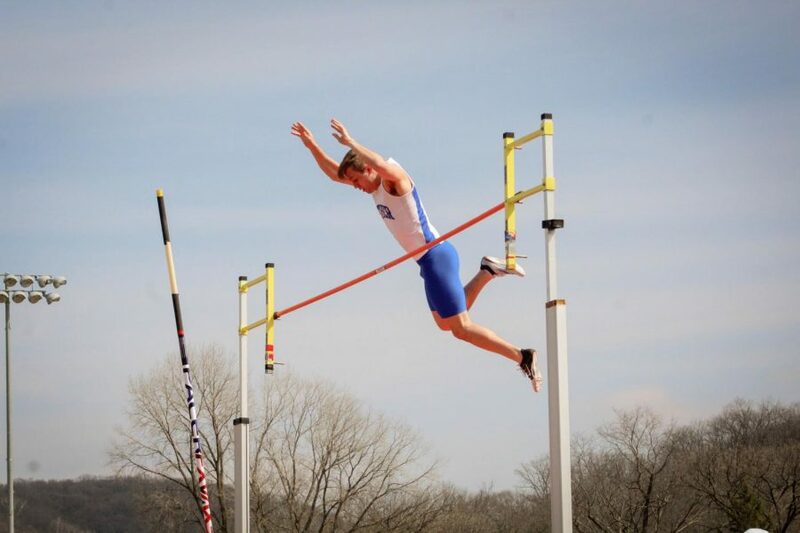 According to Assistant Professor of Health and Physical Education and Head Track and Field Coach Jeff Wettach (‘79), these two meets are particularly important for the Luther Track and Field team as their training is focused on the last few meets of the season. Going into the weekend, Wettach indicated that he is not concerned about the end results of either of the two meets. Top performances at the St. Mary’s open included Ilsa Knivsland (‘20) and Martel Den Hartog (‘19) who finished fifth and sixth respectively in the women’s 800 meter, while Aubrey Highum (‘20) placed third overall in javelin. Additionally, Erik Duethman (‘18) finished fourth in the men’s 1500 meter. Notable Luther women’s races at Drake included an 11th place finish in the 4×800 meter relay, 21st place finish in the 4 x 400 meter relay, and fourth place finish in the Iowa Conference distance medley relay. On the men’s side at Drake, the distance medley relay finished fourth in the Iowa Conference, ninth in the sprint medley relay, and Elijah Kane (‘18) placed 21st in javelin. There were no reported team scores at the St. Mary’s Open or the Drake Relays. Jonah Gehrt (‘19) said that the Drake Relays, one of the largest track and field meets in the nation, provided challenging competition. Kaia Bierman (‘18) echoed this sentiment. Additionally, Luther track and field members said that the sheer size and significance of the Drake Relays separated the meet from other events. “Hearing your name announced in that giant stadium while you’re running and I saw myself on that giant screen, that was just crazy,” Amelia Hornseth (‘21) said. Bierman added to Horseth’s comment.